I have been a fan of the show since its reboot in 2005, but I really didn't grasp the deeper layers of meaning until Steven Moffat took the helm in 2010. It was only then that I realized that the show – in its various iterations – has enjoyed decades of success because it speaks to core archetypes, sacred geometries, and global myths, depicting our mystical human potential. In listening to the interview (posted above), some of the other longstanding themes of the show began to crystallize in my thinking. It occurs to me that one of the central conflicts of the show is between our unfettered organic potential and that of inorganic technologies which enhance certain capabilities but rob humanoids of their core humanity. Two of the Doctor's nemeses, long-time enemies of Time Lords and of life throughout universe, are the Daleks and the Cybermen. Those constructs go back to the original run of the show and their distinctly B movie appearance has changed little. 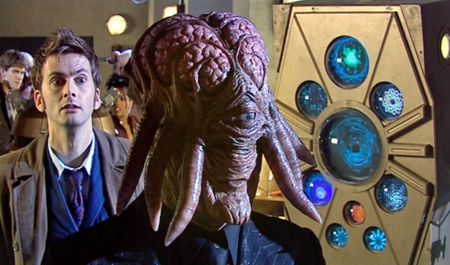 In the context of the show, Doctor Who is an alien who travels through time and space in a very unusual ship. And aren't spaceships "shiny toys for infant civilizations?" Aren't they machines? Here's where it gets interesting. The TARDIS is not what we would normally think of as a machine. It's organic, not an artificial technology. A TARDIS isn't made, but grown. It's actually a type of coral. The TARDIS has a soul. We get to know that soul more directly in "The Doctor's Wife," when it's transferred into the body of a human woman. 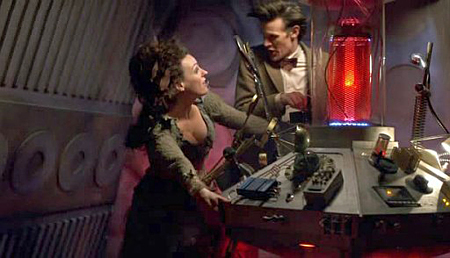 Like most ships, the TARDIS is often described and addressed as she. But one of the most obvious indications that the TARDIS is a living being is that it thinks for itself and is more intuitive, more dialed in to the great Over-Soul, than its pilot. The Doctor is frequently mystified by where and when the TARDIS has landed, but it's always exactly where he needs to be to solve some urgent problem. The TARDIS continues to grow and reinvent itself as it goes along. 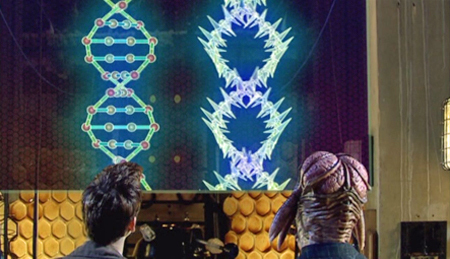 It has an Architectural Reconfiguration System which can create anything, or so we learn in "Journey to the Centre of the TARDIS." This machine that makes machines is also organic. It's made from "living metal." And it's obviously an allusion to the world tree. 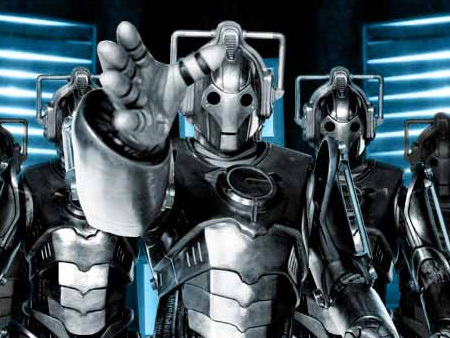 In stark contrast to the organic, evolving "machines" of Doctor Who are these cyborg species, the Daleks and the Cybermen. Daleks wear a "skin" of Dalekanium and polycarbide. Inside that metal "shell" is what remains of their organic form, mutated, shriveled, and incapable of operating independent of their metal cases. The Dalek casing also functioned as a fully-sealed environment suit, allowing travel through the vacuum of space or underwater without the need for additional life-support equipment. 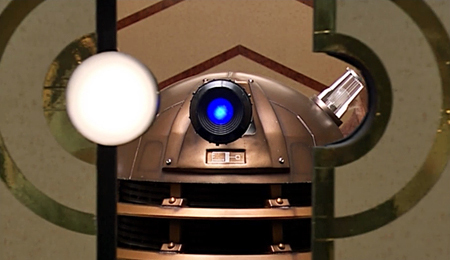 If the interior of the Dalek sustained damage, floating eyeball-like Dalek antibodies would explore the damaged area and eliminate the threat by reducing it to a fine powder. The antibodies would then harvest the ashen remains of the threat, and send them into a feeding tube for the creature to feed off their protein. It's hard to miss the parallel to something like transhumanist Ray Kurzweil's vision of the "nano nutrient garment" that has Henry deeply concerned. More information can be found here on Kurzweil's grand vision. The Twelfth Doctor once said that a Dalek was "not a machine", but "a perfect analogue of a living being". The Daleks were an attempt at genetically and technologically advancing a humanoid race, the Kaleds of the planet Skaro, so that they could win a protracted war against the Thal. Much as Henry points out regarding the transhumanist movement, the Daleks present with the symbolism of ascension. Davros has a single eye. It just happens to be electronic. The Dalek mutants that live inside this casing are also single-eyed. They also have a small blue pearl-like light in their plunger-like appendage/oculus. This suggests the horrible possibility that they are, on some level, attempting a spiritual transfiguration, but are trapped in a prison of artificial technology. 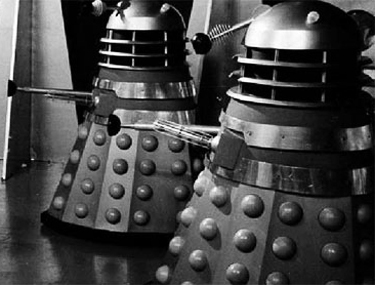 Much of their mythic history is revealed in "Daleks in Manhattan" and "Evolution of the Daleks." Daleks take over the construction of the Empire State Building in 1930. Their goal in accelerating the building schedule of the then tallest building in the world is to absorb the gamma burst of a solar flare to complete, you guessed it, an evolution of what's left of the Dalek race. So a tower (spine) is being raised rapidly to merge with the energy of the sun. The visual symbolism is pointed. The first attempted hybrid of human and Dalek has a single eye in a triangle. 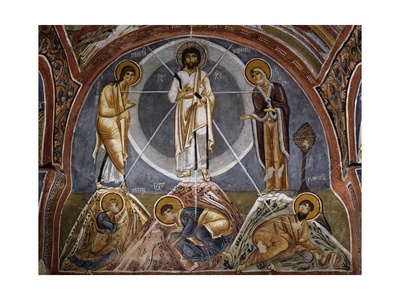 The markings on this Dalek device look distinctly like the rays of light emanating from the risen Christ in Byzantine frescoes and icons of the transfiguration. The elevator door is decorated with a beautiful, golden, art deco circumpunct. The elevator opens onto a perfectly framed Dalek oculus appendage thing. The Daleks are all but extinct and their only real hope is to reinvigorate what's left of their genetic material with an infusion of human DNA. This creates tremendous conflict between the Daleks themselves and within the attempted hybrids. In a fairly obvious symbolic play, a showgirl performs a number called My Angel Put the Devil in Me in which she plays an angel among devils. The opening lyrics suggest the engineered psychopathy of the Daleks. My bad, bad Angel, the Devil in me! It would be easy to conclude that this is a simple, good vs. evil morality play, with the Daleks as the obvious black to our white. I think there's a deeper point here. The Daleks are attracted to humans because they see so much Dalek in them. After absorbing the ambitious businessman Diagoras, Dalek Sec, the first ever human Dalek, marvels at what he feels of human nature, it's aggression, it's hatred, it's "genius for war." "No. That's not what humanity means," argues the doctor. "I think it does. At heart this species is so very Dalek," replies the newly bipedal Dalek Sec. Where the Doctor always sees and hopes for the better angels of our nature, Dalek Sec sees that there is a very dark side to humanity, one that could as easily destroy itself as the Daleks and their organic forebears did. Indeed, this storyline underscores one of the darker chapters of our history. It's thirteen years after WWI – the "war to end all wars" that most certainly did not. It's one year after the stock market crash and suddenly destitute Americans live in Hoovervilles, human fodder for a handful of dangerous, insecure jobs like building the Empire State Building. 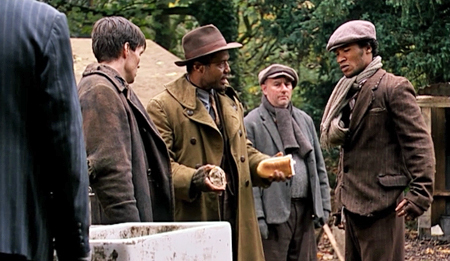 In Central Park's Hooverville, a war veteran named Solomon solves a conflict over a loaf of bread by reminding them that in the worst of times, they cannot lose their humanity. 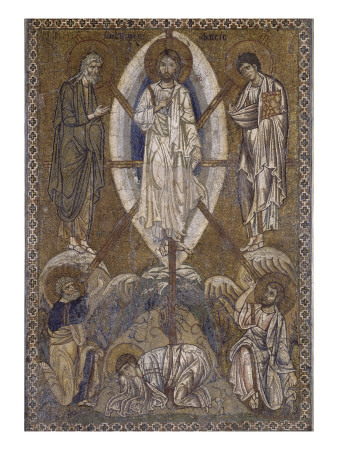 The wise Solomon tears the loaf in half and splits it between the two men. As anyone with a passing knowledge of the Bible knows, King Solomon solved a conflict between two women claiming parentage of a child by threatening to cut the child in half, and handing the living child off to the woman who was first to relinquish her claim so that the child might live. The allusion is not what you would call subtle. What is a bit more deft here, I think, is that it is another example of sun symbolism and of the central sun as an awakener of our Sophia wisdom. Sol is Latin for sun. Ultimately, the Daleks are too trapped in their cold, emotionless, metallic identity to accept anything that the sun in any form might awaken. Their hybrids are too human, too Time Lord, too independent for the rigidly hierarchical, authoritarian, mechanoid monsters to accept. A more explicit take on the threat of transhumanism can be seen in the reintroduction of the Cybermen in the new Doctor Who. 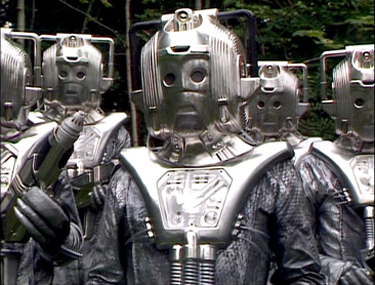 There have been several iterations of the Cybermen throughout the show's history. Made almost entirely of metal, they run on human brains but have artificial nerve tissue, a "heart of steel," and an emotion inhibitor. They make up mindless, automaton armies bent on conquest and absorbing more humans into their numbers, much like the Borg. 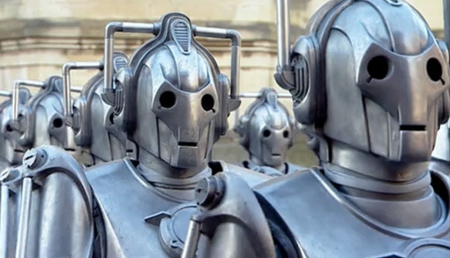 The Cyberman were reintroduced in the second season of the new Doctor Who in "Rise of the Cybermen." On a parallel earth, the doctor's companion Rose Tyler learns that her father is still alive in that world and is a captain of industry, having turned his idea for a health drink into a successful business. Vitex is also owned by a huge, multinational technology and information company called Cybus Industries. 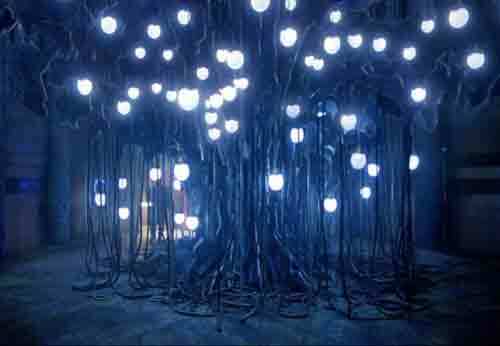 There is much about this parallel earth and its technologies that feels a bit too close to home. In many ways it looks identical, right down to the blue tooth headsets that everyone seems to have. That is until it becomes apparent that the population is being fairly well controlled by them. These EarPods are not only an obvious allusion to iPods, Apple introduced it's own version of the EarPod in 2012. Life imitates art. Theirs' don't appear to hijack people's brains... yet. There is actually so little difference between Doctor Who's scenario and the current developments in the world of tech, it's downright chilling. Much like Kurzweil and the tech giants currently investing in transhuman technologies, Cybus Industries president John Lumic is obsessed with life extension. He calls the conversion to Cyberman an "upgrade." Not only are Cybermen extremely hard to kill, this theme of immortality comes up again and again in the Cyberman episodes. In "Army of Ghosts," they begin to bleed into our world from the parallel world of Cybus Industries and are mistaken for the spirits of dead relatives. In "Dark Water," they become the receptacles for the spirits of the dead and a potential zombie-like army. We can have virtual immortality, so long as we're willing – or can be coerced – to turn our bodies and our souls over to the machine. The Doctor has been warning us since the 1960s about the potential for transhumanist technologies. The show presents us with a choice. Do we seek to understand our true human potential or attempt to enhance it by artificial means and wind up soulless mechanoids incapable of moving to the next level of natural evolution? I have not been online lately but checked in to see what you are writing. Great article. Actually I have been focused lately on this same "subject". I have chosen Immortality. This means that I choose the Biggest Idea is that death is an illusion. What that means is I laugh at the fear of death and wonder: "what is god's body able to do on its own merit???". There comes a crossroad when one must recognize that one has a choice to be the example of living from immortal SELF (or not). Cycles come and go. The Apocalypse is unveiling and with the matrix and all the contrast, one has a clearer picture. I am immortal, self regenerating and evolving and I am within the omnipotent, omniscient, omnipresent LIFE. But if I cannot see this is the case? One cannot force consciousness, it upwells from readiness. There is always the opportunity some "time" to ASK "WHO AM I?" IF " I " have not been able to see the choice for godness is THE GATE then " I "cannot cross the threshold. This is a grand drama. Hey Maggie, nice to see you. Here's a little more food for thought.